1mbps Students Package recently upgraded to 4mbps. posting EVO speeds tests are pointless in my opinion, since the speed can vary wildly every few minutes. one minute im getting 2mb speeds the next 0.2mb. brilliant quality of service.. Results is batter after upgradation of a network mean my area BTS is 3G or 4G ready. bhai g still same old trick ? Hashim bro , Now very hard to do so ! whats your subscribed package of dsl ?? do u live in karachi ?? which area and wat is ur ip pool ?? and also wat is ur line profile is set at ?? downstream and uptream rate in modem ?? 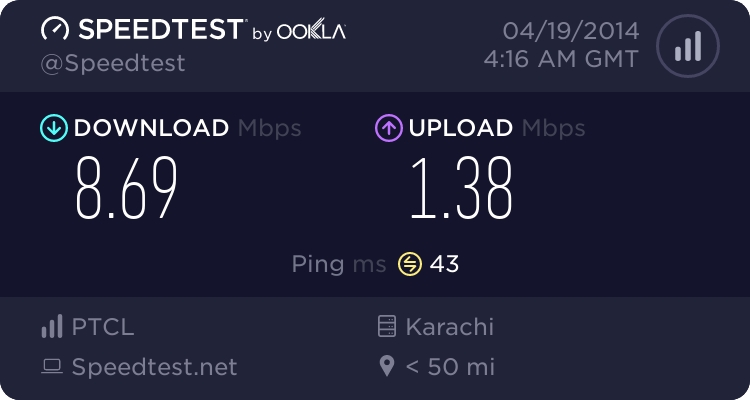 i also have 4m but not getting more than 3.5m down and 0.7m up and my ping also not stable it is used to be above 250ms in all karachi servers e.g; worldcall , qubee or mobilink gsm ... Tell from which server u tested ur speed in karachi ? ?